Arseniy Yatsenyuk might not have been the best prime minister of Ukraine, but he certainly was an entertaining one. Sputnik compiled Yatsenyuk’s top comical, bizarre and sometimes ridiculous acts which put him in the center of numerous scandals. On Sunday, Yatsenyuk announced his resignation as the prime minister of Ukraine. During his televised resignation speech, Yatsenyuk left in style, accusing his colleagues in the Verkhovna Rada of not sustaining "high standards" and following his plan of saving Ukraine. 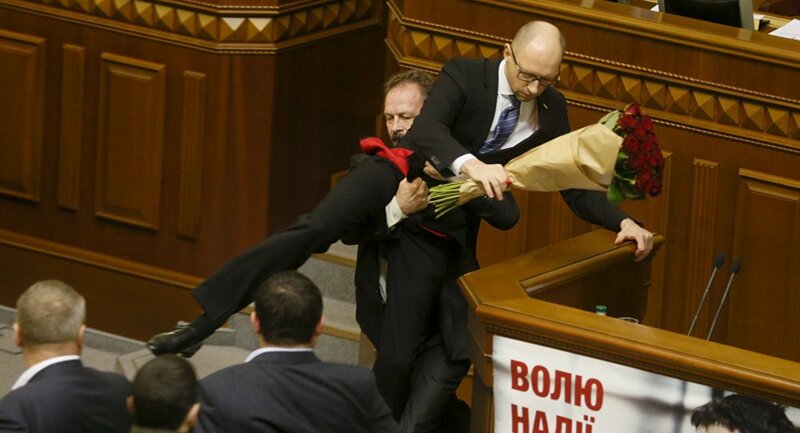 Below are other jaw-dropping moments Yatsenyuk did while the Prime Minister of Ukraine. Last May the prime minister announced he wants to build a wall on the entire 2,400-km border with Russia. The project was initially named the "Wall," but Yatsenyuk later renamed it to the "European Wall." The prime minister wanted the wall on the border between Russia and Ukraine to be the system of defensive fences, equipped with watchtowers. According to the initial plan, the project had to finished by 2018 and cost 4-billion hryvnia ($160-million). However, the project seems to be all talk and no walk — out of the 2,400-km wall only 270-km is currently finished. In December 2015, while Yatsenyuk was speaking in front of Verkhovna Rada deputies, a man from the Petro Poroshenko Bloc (the political party led by President Petro Poroshenko) came up to Yatsenyuk, gave him the bouquet of flowers and tried to physically carry the prime minister out of the platform, interrupting his speech. A brawl immediately ensued, as Ukrainian politicians are often ready to settle political differences using their fists. To his credit, during the brawl the prime minister didn't let go of the bouquet. "It's all good. There are many idiots here," Yatsenyuk later commented on the situation. While visiting Germany in 2015, Yatsenyuk tried to "impress" the Germans with his knowledge of World War II history. In a cringe-worthy interview with the German TV channel ARD, the Ukrainian prime minister claimed that the Soviet Union invaded Nazi Germany, not vice versa. "All of us still clearly remember the Soviet invasion of Ukraine and Germany. Nobody has the right to re-write the results of the Second World War," Yatsenyuk said. In April 2015, the Verkhovna Rada adopted a bill crafted by Yatsenyuk which changed the legal status of the Organization of Ukrainian Nationalists (OUN) and the Ukrainian Insurgent Army (UPA), the ultra-nationalist paramilitary organizations led by Stepan Bandera, awarding their fighters with the Hero of Ukraine titles. — José Carlos G Luengo (@jcarlos_gluengo) 3 апреля 2016 г. ​It is worth noting that during World War II, OUN and UPA carried out large-scale genocide against Polish and Jewish populations living in Ukraine. As many as 100,000 Polish civilians are said to be massacred by the Ukrainian nationalists in Volhynia and Eastern Galicia. Last December the Yatsenyuk government said it won't repay any of its $3-billion debt owed to Russia. Moscow filed a lawsuit against Kiev at London's High Court over the debt issue. 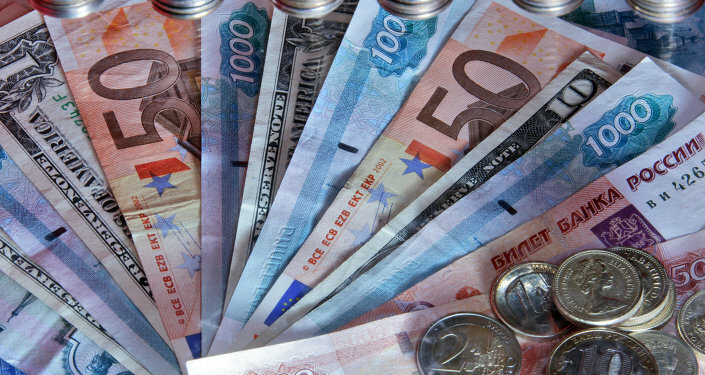 According to Russian Finance Minister Anton Siluanov, the lawsuit was a last-resort measure as Kiev not only refused to pay its debt, but also wasn't willing to negotiate a mutually acceptable compromise. Yatsenyuk's reaction was to announce a moratorium on the payments of all Russian debt. Yatsenyuk eagerly tried to make Ukraine a NATO member and carry out defense reforms in the country. "There is no doubt that Ukraine should become a member of NATO, and this is the main goal of the defense and security reform," the prime minister said. In his mind, after NATO membership, Ukraine would then naturally join the EU. However, Yatsenyuk's dream doesn't really come in line with the thoughts of top EU politicians. European Commission President Jean-Claude Juncker poured a bucket of cold water on Yatsenyuk's European aspirations, stating that "Ukraine will definitely not be able to become a member of the EU in the next 20-25 years, and not of NATO either." Yatsenyuk told Ukrainian school children and students to stop using the Russian-made social network Vkontakte and switch to Facebook instead. What was the logic of the prime minister? Simple: the founder of Facebook, Mark Zuckerberg, is a Ukrainian fellow as his family, according to Yatsenyuk, is believed to have immigrated to the United States from Ukraine's Odessa. The US-born tech genius, however, doesn't have any known Ukrainian ancestors, with his background coming from Jewish residents of Germany, Austria and Poland.